Sesame Street! The whole world loves the puppets from Big Bird to Elmo. They are so popular not only in the US, but also in China. They are still screened on China's many kids TV channels. Now the live version comes to Beijing for the very first time on August 12. The Global Times (GT) takes the chance to talk with Vincent E. Egan, President/CEO and Executive Producer of VEE Corporation, which launched Sesame Street Live in 1980, and performer Kevin Wheeler, about their upcoming Beijing tour. GT: Now you are traveling around cities in China. How do they react to this play? Vincent E. Egan: We are honored to bring it to China, as families around the globe deserve quality live entertainment that relates to a young child's level of development. "Elmo's Green Thumb" is about discovering nature, our role in it, and learning how to take care of the Earth we all share. The theme of the show translates well across all cultures and locales. Our characters and shows have a universal appeal – children around the globe, whether in Minnesota or the provinces of China, can relate and connect with the characters, songs and stories. Children's personal reactions are clapping, singing and dancing along with the characters. GT: What do you think is the most important aspect in the show's long run? Why is it so popular? Vincent E. Egan: Our experience and dedication make us one of the most respected names in the industry. The enduring popularity of classic children's characters ensures our success, as does our unwavering commitment to quality and integrity at every level. 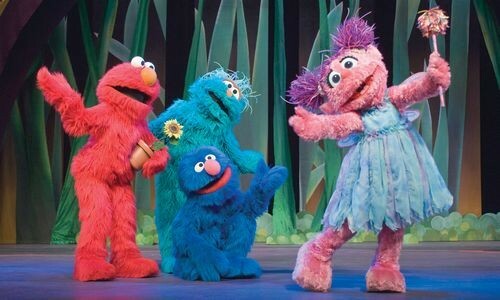 Sesame Street Live characters and humor work on multiple levels and engage and amuse children and adults alike. GT: What is the difference between the stage play and the TV show? Vincent E. Egan: The live shows are highly interactive. The characters encourage audience participation, such as clapping and singing along, and even leave the stage to engage children in the audience. The thrill of live theater is something we encourage all families to experience; VEE is committed to both entertain and educate its audiences. As wonderful as television and other electronic media are, nothing can replace the dynamic of live entertainment, shared with others in a given moment in time. GT: How many actors and actresses do you have? How do you choose them? Vincent E. Egan: The cast consists of 13 professional dancers. VEE Corporation holds auditions in select US cities each year. We recruit professional singers and dancers who wish to travel, share smiles with audiences around the globe, and who can serve as strong ambassadors for the Sesame Street brand. GT: Tell us about the costumes of the characters in the show. Vincent E. Egan: Your readers might be surprised to learn that Big Bird is made from 4,000 custom-dyed turkey feathers. Each feather is individually hand sewn to a piece of yellow fabric before being attached to the costume; other costumes are created from fur and foam. There are 50 individual fabric panels in Abby Cadabby's skirt as well as 100 sequins; Abby Cadabby's hair is made up of 2,900 individual strands of tubular horse hair. Ernie's sweater is knitted from 2.2 pounds of cotton yarn – equal to 4,156.38 feet or nearly one mile of yarn. GT: Tell us more about the music. Is it just for kids? Kevin Wheeler: I expect the Chinese audience to enjoy the colorful costumes and the fun Western music. Watching the dancing and the choreography from the show is just like watching a Broadway musical from New York, and I think the audience will enjoy this sample of US culture.